When Billy learned that Stan Lee would be at the 2012 Calgary Comic and Entertainment Expo, there was no question that we would be paying to stand in line for a few hours to get his autograph. Mr. Lee ended up being about an hour late but once the line started moving it was pretty quick. Our time with Mr. Lee was very short, but Billy had time enough to tell him something along the lines of “Thank you for making my childhood as awesome as it was”. And managed to get his Marvel Encyclopedia autographed. Lots more standing in line and waiting ensued. 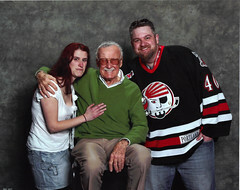 As we neared the front of the line, it hit me that we were going to have our photo taken with STAN LEE! The mastermind behind so many iconic characters. A legend! I became emotional (as I am wont to do) and started to cry. As we were ushered into the photo area, I gave Mr. Lee a hug and a kiss and cried some more (OMG I JUST GAVE STAN LEE A HUG AND A KISS AND HE PUT HIS ARM AROUND ME!!) Then, without enough warning to regain my composure, the photographer clicked the shutter and immortalized my emotions for ever. Despite the horrible photo of me – It’s certainly an opportunity I am very happy not to have missed. 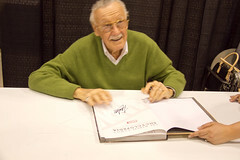 Pingback: Chronicles of Opportunity » Blog Archive » Stan Lee – Redux!